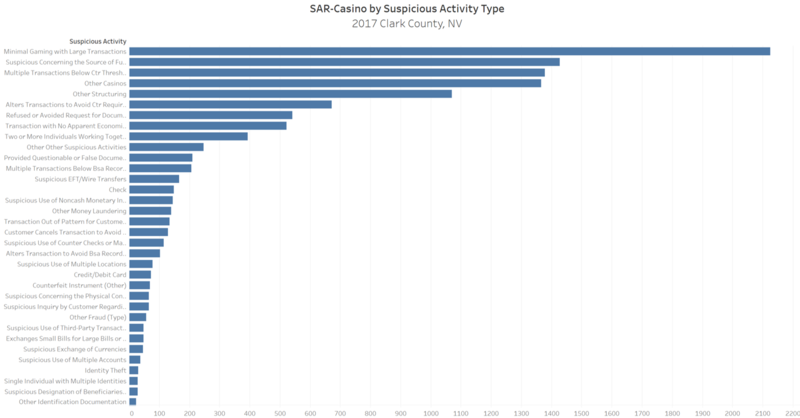 Multiple media outlets have reported that the gunman responsible for mass shooting in Las Vegas was the subject of over 200 Currency Transaction Reports (‘CTR’) and/or Suspicious Activity Reports (‘SAR’) filings. 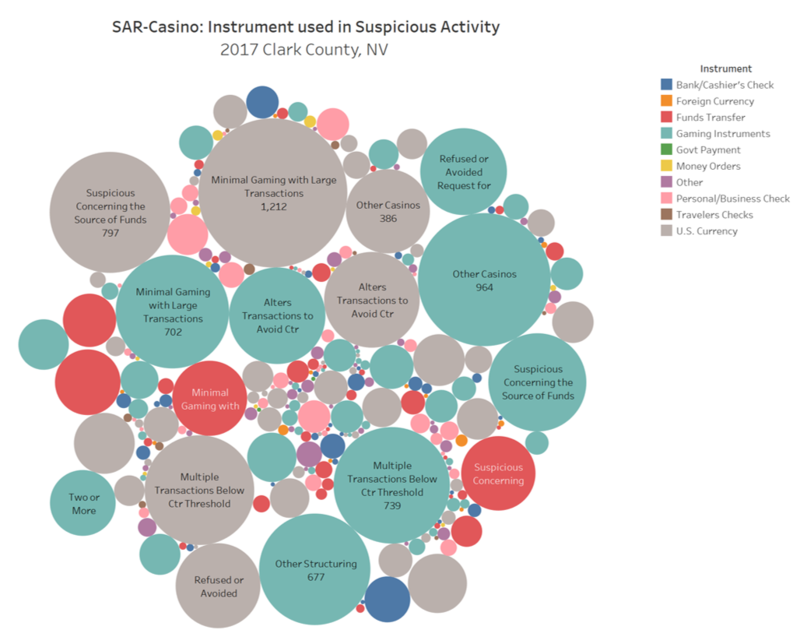 Dynamic Securities Analytics, Inc. (‘DSA’) prepared the analysis below of 2017 Casino SAR filings for Clark County, Nevada. There were 8,028 SARs filed in Clark County through August 2017. The analysis identified “Minimal Gaming with Large Transactions” as the leading suspicious activity type. Other leading suspicious activities include: Suspicion concerning the source of funds, Multiple transactions below CTR threshold, and Altering transactions to avoid CTR reporting. When the instrument type (i.e. 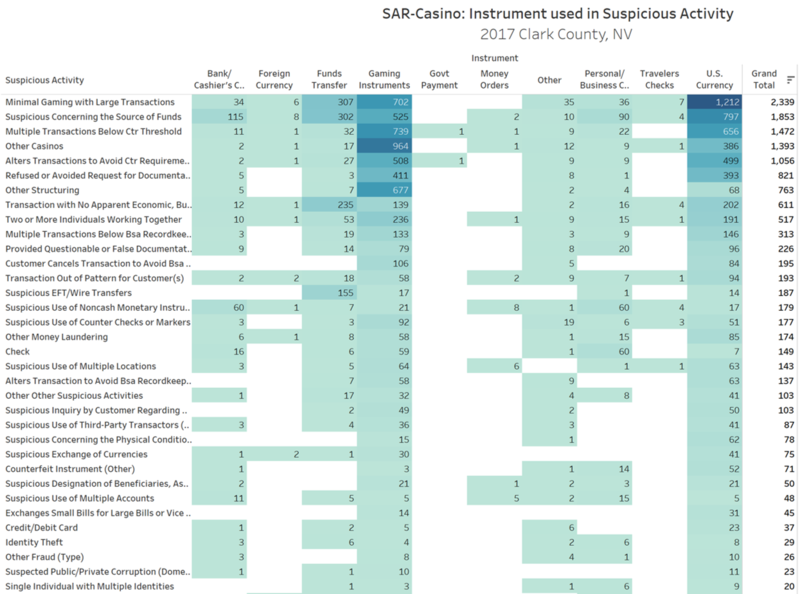 Cashier’s Check, Gaming Instrument, Cash, etc) is added to the Suspicious Activity Type, DSA found that US Currency is most often combined with Minimal Gaming with Large Transactions. Additionally, DSA found that Gaming Instruments were the prevalent instrument used in a variety of suspicious activities including Suspicious Wires and Transactions with No Apparent Economic Purpose. ← Are Title Insurance Companies Meeting Luxury Real Estate AML Requirements?